There was a time in my life when all I did was count calories and my days were measured in how well I did in this game of “good” or “bad” pertaining to what I ate. I did not eat to nourish and feed my body. I ate with the intention of never gaining weight and I did not care what it really took. Diet soda was calorie free so it was all you can drink, right? Sugar in my coffee?! I will save some calories by adding sweet n’ low or some other artificial sugar. This was the broken way of thinking and viewing food. Food was the enemy so to say. In my warped way of thinking there were good foods and bad foods. These were all based on calories rather than nutritional benefits and values. Things I eat on a daily basis now like nuts and nut butters were sworn off for the most part because of the number of calories. It was all black and white and there was no gray. Like I said, my day was measured by how well I did or “behaved” in the face of food. If I ate one of the “bad” foods like peanut butter then I blew it. I chided myself for not having more discipline and control and then would exhaust myself figuring out how I would have to “make up” for my poor decision making. There was another bit of warped thinking I had that occurred for a long time. For so many years, the goal of working out and exercise was primarily for the sake of changing my body. I was not happy with my body and focused so much on the things about it that I wanted to change that it became the sole focus of exercising. So between my terrible relationship with food and poor outlook of exercise, I lived a life of misery, exhaustion and completely void of self love. When it came to food and exercise my obsession with perfection and control led me only away from happiness. Life is not living if you live the way I did, not one bit. For one, when we strive for a perfection that we are not even certain as to what it entails, then we will certainly never be satisfied or content. Never did I ever have that feeling of relief as though I had finally “made it” so to say to this vague and abstract achievement. Food was the one thing I needed to be nourished and yet I treated it as though it was an enemy. When I did not have a “good day” as far as eating went, then I only ended up being punished by having to make up for it all the more by working out harder, longer, etc. It wasn’t as if there was a day when I woke up and said, Hello food, it’s time we became friends. Nope, didn’t happen like that. It was a lot of things that just started to add up. For one, I remember giving up magazines that use the same tactics that my brain so often used on me. The magazines that constantly promised the answers to get the perfect body or those that focused so much on exercise primarily as a weight loss tool. Yoga was another game changer for me. I have said time and time again that yoga opened my eyes to finally see my body as that beautiful temple that it has always been. Yoga made me want to take care of my body and put things in it that would give it energy, make it stronger and function. Slowly, as I shifted into the mindset that food is fuel and energy, I noticed how eating low calorie foods were doing nothing for me. When I ate avocados, almonds, oats and all of these filling foods I was energized and fueled instead of exhausted and run down. I slowly started to see the balance that was created even when I ate these once forbidden foods that were whole and real instead of overly processed foods that promised to be only 100 calories. Letting go of the need for perfection when it comes to what I eat has been so very hard for me and yet so very liberating. Sure I try to avoid processed foods and refined sugars and flours and eat real whole foods, lots of fruits and veggies, etc., but if I am not perfect it’s not the end of the world. So often I hear other women shame themselves and talk about how bad they have been when talking about what they have eaten. Food is not the enemy, it’s the way we view it and our relationship with it. And if we don’t make friends with it, it’s only going to make us more and more miserable. The biggest challenge I have come across recently has pertained to this blog. Recipe development requires a lot of taste testing…yea, I know, it’s so rough, ha. Sometimes a taste becomes a spoonful, and another spoonful, and then more. These are the times when I feel as though I am brought back to that black or white thinking where I have either been “good” or “bad” and at that point, since I have been bad, then I just blew it…and I tailspin into the downward spiral back to where I started. I am definitely still working on this from day to day. There are times I look in the mirror and revert back to old ways of thinking. When I start to guilt myself for eating too much or not making the healthiest choice, I have to really bring myself back into focus. This broken relationship I had with food for so many years is slowly being patched up. We are making amends and I am starting to realize that food is actually quite the good friend, and the friend I really need in my life. Speaking of forbidden foods, I am not sure where I would be today without peanut butter, almond butter and cashew butter. These are my very favorites and a staple in my diet. I can’t believe I denied them for so long! 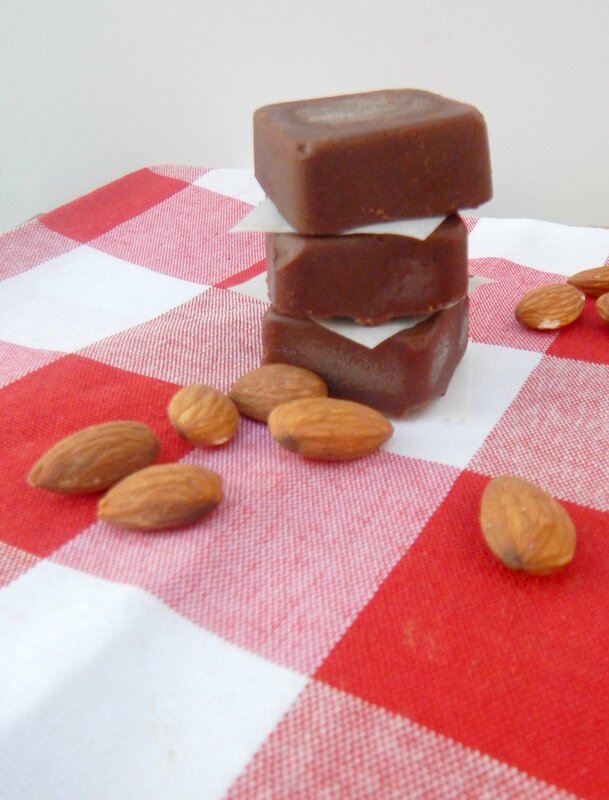 This recipe is another flavor of freezer fudge. 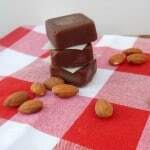 This particular recipe is a Dark Chocolate Almond Freezer Fudge and is so easy to make it’s almost insane. Literally stir all the ingredients together and freeze. That’s it! Get a little extra antioxidants from the cocoa and protein and fiber from the nut butter. Feel free to change the nut butter up to your choosing. And then sit back, relax and enjoy and savor the melt in your mouth treat! 3/4 cup almond butter cashew butter also works very well! Combine all ingredients into a mixing bowl and stir well until smooth. Pour into silicone molds or into a small pan lined with parchment paper and freeze for about 1 to 2 hours. Cut into pieces or remove from molds and enjoy. 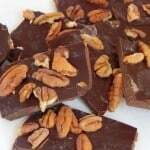 If you store in the freezer, let the fudge sit out for 5-10 minutes before eating to soften.